Africa is mostly an agrarian economy; they are unable to grow economically because of fossilized pre-industrial and pre-agrarian-revolution social formations. With no industrial revolution, socio-economic structures are in degenerative state rather than accumulative state. With the evolving disease pattern, diseases such as malaria, tuberculosis and HIV/AIDS are globally present though but others like sleeping sickness are specific to Africa. Inoculation, vaccination and other preventions are available but lack of easy access to health clinics and high cost of certain treatments put help out of reach for the maximum population. Malaria is widespread and kills one African child every 30 seconds, leading cause of death among under-fives in many countries. Bilharzia (also known as Schistosomiasis) is another common disease, caused by parasites which live and breed in some freshwater snails. Lassa fever, specific to West Africa, is highly contagious and can cause severe illness. However, polio is eradicated from many parts of the world, is still endemic in Nigeria and outbreaks occur in other parts of Africa. Other common diseases include elephantiasis, leprosy, helminthiasis and trachoma. If ignored, most diseases will cause severe debilitation which limits the sufferer’s ability to earn a living. Out of 1 billion inhabitants, 90% will be under 60 age group which tends to transform the healthcare industry in Africa. In 2016, Flint Atlantic (Nigerian based healthcare impact investment firm) announced an investment jointly with US-based Polaris Partners (Polaris), a leading global healthcare venture capital firm to fund AHN’s expansion in Rwanda and across Africa over the next two years. Private providers sense opportunity in Africa healthcare, for instance, in Nigeria, where it has sold portable ultrasound scanners, GE has trained carers in remote villages how to identify the biggest pregnancy-complication risks. According to the International Finance Corporation and World Bank, African healthcare sector valued USD 35 billion in 2016 and tends to increase by the projected CAGR of 6% over the forecast years. African pharmaceutical market was USD 19 billion in 2016 and is expected to reach USD 62 billion by 2024. 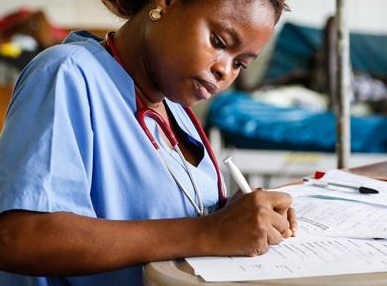 Emerging private healthcare is contributing to the growth of African health system. Countries like Botswana, South Africa, Mauritius and Lesotho that had the most room for improvement among others owing to relatively high life expectancy and expenditure on healthcare. Botswana has brunt of the AIDS epidemic with remarkable resilience and is now one of the highest life expectancies in Africa. Transforming healthcare system such as hospitals/clinics integrating IT with operations, in-country manufacturing, increasing options for micro-insurance, improvisation of care delivery, more solutions for providing POC healthcare, increasing focus on home diagnostics are driving the African Healthcare Market. Socio-political movements associated with decreasing Africa’s dependence on foreign aid is gaining traction and efforts of regulatory harmonization across Africa tend to brighten up the African healthcare industry. Challenging factors based on health workforce, medical products, vaccines and technologies, information, financing, and services delivery hinders the African healthcare system. Additionally, continuous confrontation by communicable and non-communicable diseases weakens the health system across Africa. Babylon, a UK based start up raised USD 60 million to build an AI doctor, started offering telephonic digital consultation to people of Rwanda.